Network Backup Software for business-level users allow saving different data over local or worldwide connections as backups. Handy Backup is a perfect example of a remote backup solution, providing plug-ins for both standard online data (e.g. 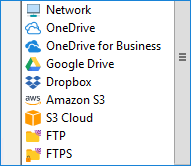 clouds and FTP) and specialized data (such as databases). With an automated backup program, you cannot forget about taking regular backups! 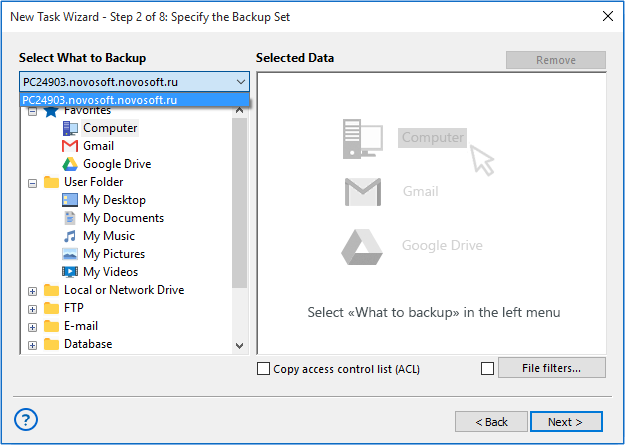 Handy Backup allows you saving your data at a precisely defined time, with an interval from months to one minute, or by some event such as user logon, or when you are placing USB storage into a PC. The well-developed plug-in system of Handy Backup allows you taking snapshot from any data you can imagine in automatic mode. A database? No problem. A virtual machine or an array of these machines? Yes, got it! A group of files selected by a name mask? OK. Take your network data backup automatically! Best network backup solutions can store taken backups onto as many vault types as possible. For example, Handy Backup can store data to local and USB drives, to NAS units, common and protected FTP storages, remote drives and folders, as well as cloud services such as Dropbox or Google Drive. Users guide all tasks in online-oriented editions of Handy Backup from one single machine, which contains a GUI-based Management Console controlling all remote backup agents on other machines. Thus, you have no need to use separate backup task management on each of your computers. Take full backups of your datasets online, or select between incremental, differential and mixed (full/differential or full/incremental) backup methods, to save worktime, traffic and space for backups! For network backup from many sources, it is a reasonable idea to keep some versions of the same backup dataset simultaneously, providing a version number and a time stamp for each copy. You can compress your remote backups as ZIP, encrypt saved datasets with BlowFish, or even keep your backup data unchanged, which allows you to browse and use your data directly from backup folders! 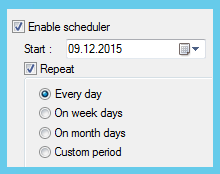 If you need it, start any external software or a batch file before and/or after running a network backup task. This can be very useful for different data and connection managers, garbage cleaners etc. Restore your network data with a dedicated task to the original location from that you saved these data, or to completely different location (which allows cloning, submitting, mirroring and exchanging data!). For big amounts of linked machines, results of every backup and restore task is still principal. Take remote backup task reports on your central console, or by receiving an email from the program! 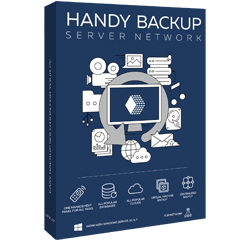 For business-level users, Handy Backup provides multi-computer centralized solution Server Network edition. A mighty edition capable to drive remote backup from many locally connected servers and workstations, this solution can save backups from different types of databases, virtual machines, data servers, clouds, websites etc. – all controlled from just one master console! Compared to single-machine editions, the Server Network backup solution has a feature of selecting a “main” computer where these solutions implement a selected plug-in for backup, restoration or synchronization. You will see a drop-down list of machines at the upper-left corner. The Professional edition for a single machine, dedicated for workstations connected to some local service, provides the “Network” plug-in to work as backup network drive software, as well as some other remote backup functions such as FTP and cloud backup. Network editions of Handy Backup support the two types of remote computers: workstations and servers. Workstations contain user-level data such as files, folders, libraries and disk images, as well as local databases or, sometimes, FTP servers. A Workstation Network Agent, connecting a workstation to a main management panel, is a feature for both backup solutions. Servers can contain both user-level data described above and specific server data such as SQL databases, VMs and VM arrays, private clouds etc. A Server Network Agent is a feature supported only by the server edition, and it cost a bit more than Workstation Agents. 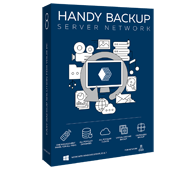 The product line of Handy Backup provides effective network backup solutions for all purposes and needs of users. Try it by downloading a 30-day free trial version of Handy Backup with a full set of data, control and network features!